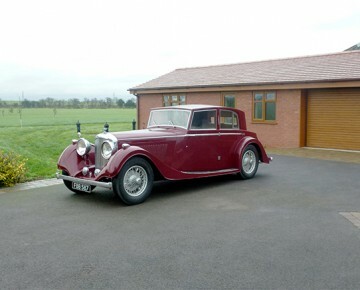 H&H have two Derby Bentley saloons on offer at their Wednesday 26 Feb auction at Buxton, Derbyshire. Lot 50 is a 1937 4.25 litre Top Hat saloon by Freestone & Webb. Painted red with cream upholstery, B177 HM is the fourth of a series of 11 examples of the second of the Top Hat designs (no 1755), and to our eyes a very attractive saloon. In need of recommisioning, it seems fairly estimated at £35 -45,000. Less expensive, but rather more of a challenge, B185 CW is one of only 10 saloons constructed by James Young on the 3.5 litre chassis. Upright, with a rounded tail, similar to the early Park Ward standard saloons, and presumably with a side-mounted spare wheel, Lot 93 is estimated at £15 -17,000 which reflects the need for total restoration. Let’s hope there is a brave enthusiast who sees her potential and preserves her from those who would buy for the chassis and parts and construct an ugly “special”. See www.handh.co.uk for more details.